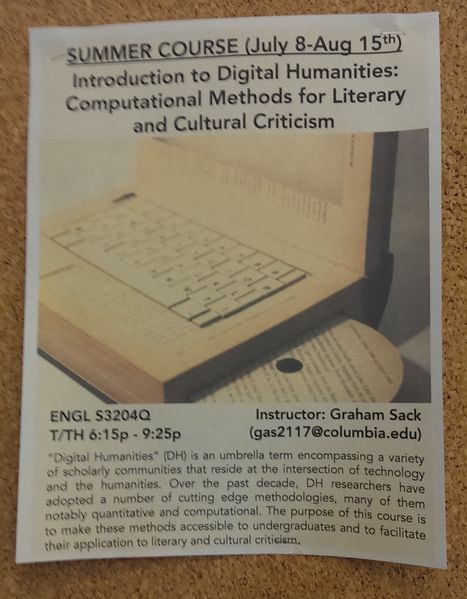 This summer Graham Sack, a doctoral student in the English department is teaching an introductory course in Digital Humanities called ''Computational Methods for Literary and Cultural Criticism''. Graham came to CCNMTL inquiring about the usage of a cutting edge approach to teaching programing to novices, a web-based programming environment called IPython Notebook. Back in June, I attended the one-day Open Analytics Summit. We aren't really doing much with analytics or big data here at CCNMTL (yet), but there are many conversations and projects happening around campus and I wanted to get a better sense of the kinds of value these methods are yielding. These issues are sure to be central to much of the research and instruction at the Institute for Data Sciences and Engineering, and have already crept up on a number of Columbia projects we have been involved with, such as the Declassification Engine and the Open Syllabus Project. Back in May, Anders attended the Ricon East, "a distributed systems conference by and for engineers, developers, scientists and architects". The distributed data-store Riak was featured prominently at the conference but the event was intended more as a conference on distributed systems in general spanning academia and industry. The slides and videos of the event are now posted, so you can check them out for yourself too. As an experiment, Anders has ported the ReliefSim application to Google's AppEngine and gotten it running on the free version at reliefsim.appspot.com (the source code for this application has been released on github: github.com/ccnmtl/reliefsim).